This is the VW UP! Lite concept, debuting moments ago at the LA Auto Show. It's a four-seat, front-wheel-drive, diesel-electric hybrid with 70MPG fuel economy. 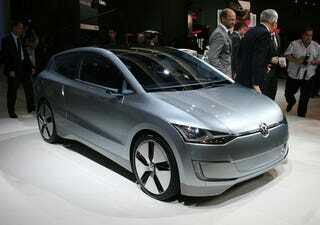 While it's not production-intent, Ze Germans have announced plans for an ultra-efficient compact by 2011. The UP! Lite takes what everyone knows following almost a hundred years of diesel electric train and applies it to cars. The sleek four-seater tips the scales at a featherweight 1,532 lbs and is fitted with a 0.8-liter TDI two-cylinder turbo-diesel engine 50 HP mated to a 14HP electric motor and a a seven speed DSG transmission. Acceleration from 0-60 MPH is pegged at a leisurely 12 seconds but still, 70 MPG! It would be like never filling up at all. Of course, this is just a "concept" but telegraphs vehicles VW is planning on rolling out globally in 2011, so we're betting it's pretty close to the real deal. Well, except for those wheels. Wolfsburg / Los Angeles, 02 December 2009 - Volkswagen – Europe's strongest automotive brand – is setting standards worldwide when it comes to efficiency with its clean high-tech TDI and TSI engines. Now this is being followed up by latest coup at the Los Angeles Auto Show (December 4 to 13): the world premiere of the Up! Lite A progressive, fuel efficient and in all details cleverly designed four-seater with a hybrid drive. Combined fuel consumption: 2.44 l/100 km or 70 mpg/highway! No other car is more sustainable. With a drive concept consisting of a TDI (turbo-diesel), electric motor and 7-speed Direct Shift Gearbox (DSG) as well as top aerodynamics (Cd value: 0.237), Volkswagen is driving CO2 emissions down to a sensational 65 g/km. This makes the three-door concept the world's most fuel efficient car – and from the perspective of its overall CO2 footprint the world's most environmentally friendly four-seat car as well. Both technically and visually, the Up! Lite is a preview of the future. The image of the car body with its clean lines, as though sculpted from a block of aluminium, underscores just how fascinating a car tuned to aerodynamic perfection can look. The styling itself portrays a compact vehicle that genuinely reflects its sustainable drive system and overall progressive concept. At the rear, the Up! Lite has the appearance of a distinctive hatchback sports car. As a result, the broad shoulder section is definitely reminiscent of the Scirocco. Furthermore, the look of the lower area is dominated by the large glass surface of the hatch, the LED rear lights and the rear fog lights (c-shaped) integrated in the bumper in typical Up! style. The counterparts of these lights are found in the front bumper as front fog lights. The car's side profile has clean styling with markedly smooth surfaces. There are no edges except for the upper tornado line, the wheel wells and a connection line integrated there. The side cameras that replace the outside mirrors look like winglets on the wings of a cargo plane. A novel stylistic and technical feature: the 18-inch wheels are produced from a combination of aluminium and carbon fiber. That is because sports appeal and fuel economy do not need to be mutually exclusive.